Beginning in New Buffalo,MI, hit the Red Arrow Hwy north. You'll see lots of art and craft stores. Once in a while you'll see a break in the trees so you can see Lake Michigan. Stop at Hager Beach, it's very secluded with very soft sand. Farther north becomes more scenic with trees. Late Sept/early Oct is the best time. Blue Star Memorial Hwy is very scenic in the Fall. Once in Holland (we stayed at Country Inn and Suites, tough to find, but nice), take James St. west to Lakeshore drive. This was an awesome ride seeing the nice homes on Lake Michigan. Once in Grand Haven, turn left on Grand Ave, then right on Harbor St. If you're riding close to sunset, I would stop at the Kirby House and sit upstairs outside and watch the sunset and boats coming in. Very romantic. I would stay off of Hwy 31 unless you're in a hurry. It's a rough hwy. Art gallery, craft stores, Lake Michigan, Red Arrow Hwy, Blue Star Memorial Hwy. The Red Arrow Hwy is a great road, gradual turns, no twisties here. Blue Star Memorial Hwy is a bit old with the occasional pothole, but nothing major. There are spots than need resurfacing, but you can avoid them. Lakeshore Drive is a pleasure. Lots of small towns south of Holland, MI. Holland and Grand Haven have tons of shopping, fuel, and eateries. I would recommend the Country Inn and Suites in Holland, MI off James St. (turn right off Hwy 31, in the shopping area in the back). 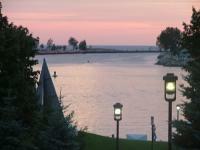 Kirby House in Grand Haven, Mi is a neat place, sit up top outside and watch the boats and sunset. on May 9, 2013 0 out of 0 members found this review useful. on April 2, 2010 0 out of 0 members found this review useful. Done this ride before and enjoyed it. Bout ready to venture out again this afternoon. Hope it goes as well as last time. on March 2, 2010 0 out of 2 members found this review useful. One of the few roads worth riding in this state.